Cook Time: Cake: 45 minutes. Cupcakes: 20 minutes. 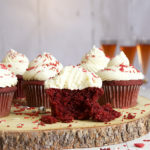 Buttery three-layer Red Velvet Cake or Red Velvet Cupcakes, slathered with Cream Cheese Buttercream and drizzled with Chocolate Ganache. This recipe creates super fluffy and tender cake, with just the right amount of chocolate flavor and red color. 8 – 16 ounces bittersweet chocolate chips (at least 60% cacao) – You’ll need 8 ounces for the layer cake and 16 ounces for the cupcakes. 8 – 16 ounces heavy whipping cream – You’ll need 8 ounces for the layer cake and 16 ounces for the cupcakes. If making cake layers, preheat the oven to 325 degrees. Using vegetable shortening, grease the inside of three 8 or 9-inch round cake pans. Use the pan to trace circles on a piece of parchment paper. Cut out the circles and place one in each pan to cover the bottom. Lightly grease the top of the parchment paper. Sprinkle some flour inside the pans and shake it around to completely coat the bottom and sides of the pan. Shake out excess flour. If making cupcakes, preheat the oven to 400 degrees. Line three non-stick 12-cup muffin pans with paper liners and spray the pan lightly with non-stick baking spray. Add the flour, baking soda, salt, cocoa powder, and espresso powder to a medium size bowl and stir with a wire whisk to combine. Set aside. Add the buttermilk, vanilla, vinegar, and red velvet emulsion to a bowl or measuring cup and stir to combine. Set aside. Add the butter and both sugars to the bowl of a stand mixer fitted with the paddle attachment. Beat on high for 2 minutes, until the mixture is lighted in color and somewhat fluffy in texture. Scrape down the sides of the bowl and add the oil and the 3 whole eggs and beat on high for about 30 seconds, until combined. Scrape down the sides of the bowl and add the egg yolks. Beat on high for another 2 minutes. Add the flour and buttermilk mixtures in alternating additions: 1/3 of the flour, 1/2 the buttermilk, 1/3 of the flour, 1/2 the butter milk, 1/3 of the flour. After each addition beat on the lowest speed just until incorporated. Do not overbeat. Add the heavy cream to a bowl and beat with a handheld mixer until soft peaks form when you lift the beaters up from the bowl. Gently fold the whipped cream into the batter, just until it’s barely incorporated. Be gentle so that you can preserve as much air in the cream as possible. If baking cake layers, distribute the batter evenly between the prepared pans and bake for 40-45 minutes, until the cakes are pulling away from the sides of the pan slightly and a toothpick inserted in the center of one of the cakes comes out without any batter on it. Remove the cakes from the oven and place on a wire rack. Let them cool in their pans for 5 minutes, then turn out onto the wire rack and let cool completely before frosting and assembling. If baking cupcakes, distribute the batter between the paper lined baking cups. Bake the cupcakes for 5 minutes at 400 degrees. Turn down the temperature to 350 degrees, and bake the cupcakes for 15 more minutes, until a toothpick inserted in the center of one of the cupcakes comes away without any raw batter on it. Let the cupcakes cool inside the baking pan before removing them. Put the chocolate chips in a bowl. Heat the cream in the microwave just until bubbles appear around the edges of the cream. Pour the cream over the chocolate and let it stand for 5 minutes to allow the chocolate to melt. Stir the ganache until the chocolate and cream are completely homogenous. If the chocolate isn’t completely melted after stirring for a few minutes, microwave the ganache on half power in 20-second increments. Ice the cake layers or cupcakes with Cream Cheese Buttercream and drizzle with Chocolate Ganache. To Make Cake Flour: For each cup of flour, remove 2 tablespoons of flour and replace with 2 tablespoons of cornstarch. You’ll need a full recipe of Cream Cheese Buttercream to ice 36 cupcakes. For the layer cake, you’ll only need a half recipe.